Volunteer and Donate to S.O.A.R. | S.O.A.R. SOAR is looking for volunteers in 2019. We will never ask you to do something your not comfortable doing. Below is a list of needs we have but if you have an idea of something you would like to help with please let us know! Please contact us at soar@soarnonprofit.com for more information. Amazon will donate 0.05% of the price of your AmazonSmile purchase. Just search Swift Outdoor Accessible Recreation. It’s the same Amazon account and does NOT cost you anything extra. You just have to use smile in the beginning of the URL to let amazon know to donate to us! 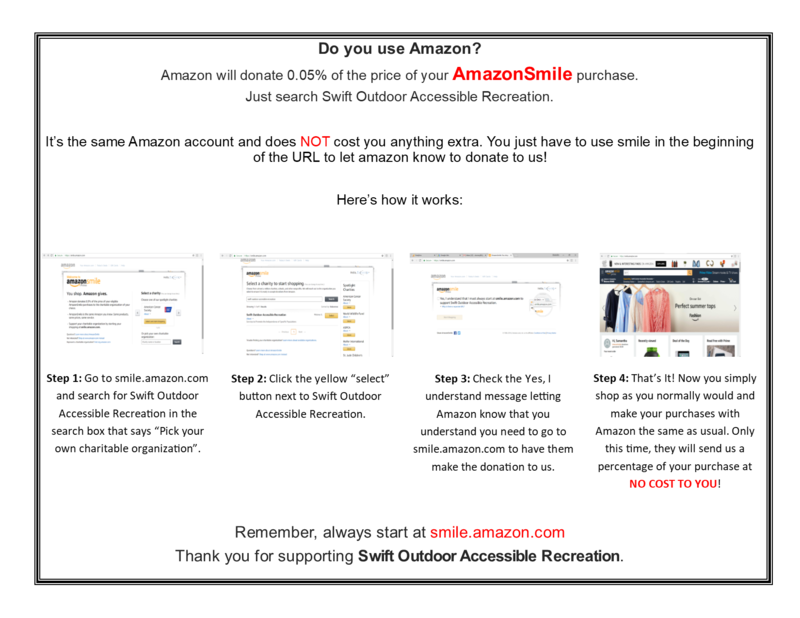 Step 1: Go to smile.amazon.com and search for Swift Outdoor Accessible Recreation in the search box that says “Pick your own charitable organization”. 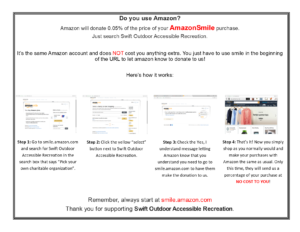 Step 2: Click the yellow “select” button next to Swift Outdoor Accessible Recreation. Step 3: Check the Yes, I understand message letting Amazon know that you understand you need to go to smile.amazon.com to have them make the donation to us. Step 4: That’s It! Now you simply shop as you normally would and make your purchases with Amazon the same as usual. Only this time, they will send us a percentage of your purchase at NO COST TO YOU! Thank you for supporting Swift Outdoor Accessible Recreation. Make an impactful difference today, tomorrow and beyond…..
One of SOAR’S missions is to cure paralysis: paralysis caused by spinal cord injury, stroke, and diseases such as Alzheimer’s, Parkinson’s, ALS, and many others. NOW, MORE THAN EVER, WE NEED YOUR SUPPORT FOR THE SOAR CHALLENGE…. Statistics demonstrate that approximately 6 million people (1 in 50) live with some form of paralysis in the United States and roughly 1.25 million people in the United States are paralyzed as a result of spinal cord injuries. SOAR will launch an innovative approach designed to expedite and intensify spinal cord injury recovery. SOAR is embarking on a bold and powerful journey to accelerate the pace of a spinal cord paralysis cure that can be implementer within a year. SOAR’S innovative cure for paralysis is based on the premiss that“The cure for paralysis is not walking” The hundreds of millions of dollars spent on spinal cord stem cell, electric stimulation, exoskeletons and other innovative cures is designed to get people back on their feet to regain some mobility. The current overwhelming premiss is that if people can walk or regain more mobility they will be empowered to regain happiness, control and become a productive person in society. “The cure for paralysis is not walking” but regaining the intangible features that make up having a quality life. Some of these intangibles are feeling like you have a purpose, a relationship, independence, feeling like your contributing to society, control over getting an education, having a good job, and more. FACT; You don’t need to be walking to you have a purpose, a relationship, independence, feeling like your contributing to society, control over getting an education, having a good job, and more. The SOAR Challenge will fund up to $10 million in total grants over a ten-year period for the spinal cord cure and improve and regain the life and some functionality for people living with paralysis. The ultimate goal of this resolute cure will be to foster collaboration, engage researchers, entrepreneurs and philanthropists to assist SOAR cure for paralysis.